As a volunteer parent coach with Blizzard you will be rewarded with the opportunity to have a positive influence on a group of children who will share your passion for soccer. If you are interested in coaching, please indicate this on your child’s registration form under the volunteer duties. Players are placed onto teams first, then coaches are determined. You will be notified by Alan Rickwood if we require you to coach. Coaching roles are appointed each season. All coaches (head and assistant) are required to complete the CMSA Security Clearance Program. We also ask all coaches to comply with the Blizzard Coaching Code of Conduct. What are my duties as a coach? What support does Blizzard provide? 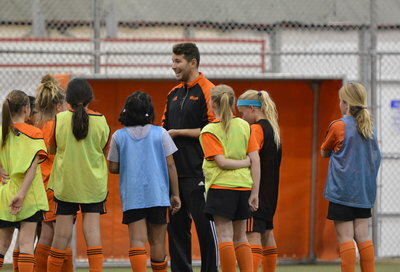 Alberta Soccer offers a number of age-appropriate coaching accreditation courses based on Canada’s Long Term Development Plan. These courses range from more recreational coaching courses based on community coaching to accreditation for more serious coaches who are looking to be licensed. Please see the Alberta Soccer website www.albertasoccer.com for details. The way in which we communicate with our players and what we say has a lasting effect on and off the sports field. We recommend these three simple suggestions for creating a positive environment for players that will foster their development, success and love for soccer and life. Please take a few moments to read The Power of Positive Youth Coaching.